An overview of the game and how to play each side (Corporations and Runners), as well as gameplay explanations through three turns in the game. Upon its initial release in 1996 by Wizards of the Coast, the gaming press lauded Netrunner as a brilliant, innovative, highly interactive, cerebral, and rewarding card game. Unfortunately, its only expansion took a full year to be released, by which time the game’s momentum had died out. Now, Fantasy Flight has brought it back from the dead, and it’s even better than it was before. In “Android Netrunner”, players take on the goal of either a large, shadowy megacorporation from FFG’s cyberpunk “Android” universe, or a computer hacker trying to take them down. This is the first brilliant part of the game: the Corporation and the Runner are different decks, and they play completely differently past the most basic game structures — there’s only one card type that works the same for the Runner and Corporation. The Corporation is big and playing defense, installing agendas on remote servers and trying to advance them enough to complete them, and putting protective ICE around them to keep the Runner out. Most everything the Corporation plays is face-down until activated, making ability to bluff and provoke your opponent into traps very important. The Runner uses programs and hardware to hack into the Corporation’s servers (and not just ones where Agendas are installed — you can hack into the Corp’s hand, deck, or discard pile! ), trying to break past the ICE and get access to the Agendas to steal them. Nothing they play is facedown, but they have more flexibility with their abilities and the initiative of choosing when to attack. The game ends when someone scores 7 Agenda points, either by the corporation keeping them protected long enough to advance and score them, or the Runner successfully getting in to steal them. That’s right, the game is so asymmetrical, the Runner’s deck doesn’t even contain its own means to win the game. Playing the Corp requires ability to plan, and ability to bluff — once the Runner starts a run, you won’t be able to use anything in your hand, just things you have in play. You need to set traps for your opponent and keep them away from your valuable Agendas. The Runner needs to be able to read the Corp to avoid traps and ambushes, and properly manage risk and reward to get access to their Agendas without overextending yourself or taking too much damage. The core gameplay is incredibly flexible and makes every decision meaningful — instead of having a bunch of defined phases wherein you draw cards, recover resources, play as many cards as you can afford, then attack, turns are made up of four “clicks”. Each click is used to draw a card, gain 1 credit from the bank, play a card, make a run, advance an Agenda, or activate one of your in-play cards that use up clicks (as well as a few other actions that are more specific, like getting rid of “tags” or using them to destroy the Runner’s resources.) The Corp’s first click for the turn is always used to draw a card, so they only get 3 clicks to spend, but other than that your turns are wide open. Card drawing is not the bottleneck it is in other games; players can draw 4 cards per turn if they want without using any dedicated draw cards. It’s an amazing, fluid system that manages to keep players feeling like they always have options, and keeps every credit and card valuable. Android: Netrunner actually improves on the classic 1996 Netrunner in several notable areas, to boot. There are now factions for both Corp and Runner, and factions have different specialties and weaknesses to focus on, rather than every card being playable in every deck for the appropriate side. Corp factions are four different megacorporations the player can represent: Jinteki has the best ambushes and deals net damage to the Runner, Haas-Bioroid uses recursion and ICE that is staggeringly powerful but includes built-in ways to bypass it, NBN is unparalleled at tracing the Runner to “tag” them and use that information to screw with them by destroying resources/closing bank accounts/et cetera, and Weyland Consortium is big, ugly, has tons of money, and no sense of ethics whatsoever. Runner “factions” are more like philosophies: Shapers are in it to prove their skill and creativity, and have some of the best custom hardware and icebreakers; Criminals are in it to enrich themselves and get the most money and several tricks to gain easier access, and Anarchs just want to watch the world burn and focus on Viruses that weaken the Corp’s ability to fight back. Every faction has a character or corp card with a special ability and deckbuilding restrictions on it; in the core set, every deck must have a minimum of 45 cards and a maximum of 15 “dots” of out-of-faction cards; faction-aligned cards have one to five dots in the corner indicating how easy they are to splash into other decks. This gives players ability to customize, but still keeps them roughly sticking to their faction of choice. The only problems with the game are very, very minor. There’s an ambiguity in the rulebook about if the Corp’s fixed card draw counts as an action or not (which is relevant a few times given that certain things can be used after actions but not before them), the special names given to the Runner’s hand and discard pile (“grip” and “heap”) are silly, and there’s one Corp card, Scorched Earth, that kind of forces Runners to always play as if their opponent had it in hand because it will kill them immediately if they leave themselves open. And… that’s pretty much it. Everything else about the game is pure genius from top to bottom and a shining example of everything a card game can and should be. Buy it. You won’t regret it. Android: Netrunner is a revival of the mid-90s CCG Netrunner, originally designed by Magic: the Gathering creator Richard Garfield. This incarnation has been liscensed by Fantasy Flight from Wizards of the Coast and is a part of their Living Card Game (LCG) line of products. The game throws players into a dystopian, cyberpunk setting (think a heavy helping of Neuromancer with a dash of Snow Crash liberally sprinkled in) with one player representing a Runner (i.e. hacker) and the other playing as a megacorporation defending its servers. Gameplay is asymmetrical with both players pursuing the same basic objective (gaining 7 agenda points) through drastically different methods. The initial setup can be quite lengthy. As with most every Fantasy Flight LCG, there are some tokens to be punched out and such, but the majority of the initial setup time comes from the rulebook. The rulebook is pretty heft compared to most other card games, largely due to the asymmetrical nature of the game. This means that you’re largely learning two different sets of rules for one game: one set for the runner and nother set for the corp. The rule book discusses many of the rules well, but the FAQ on Fantasy Flight’s website is pretty necessary to fill in some of the gaps, which was frustrating initially. I would suggest watching a video tutorial to help the rules make sense more easily. The tutorial on FF’s website is about 20 minutes, but isn’t as helpful as some YouTube video walkthroughs, many of which clock in near 45 minutes. At any rate, there is a somewhat significant time investment prior to the first game if you’re self-teaching. After that, it’s just a matter of shuffling decks. Once you have the hang of it, you can either continue playing the precon decks or, particularly with the addition of expansions, invest a potentially significant amount of time into a deep deckbuilding system. Much like M:tG, Netrunner can be a complicated game to explain in all of its nuances, so I won’t attempt that in this review. Instead, I’ll just stick to the basics. One side is the Corp player, who attempts to advance “agendas” in order to score points while protecting their servers with ICE (intrusion countermeasure electronics, for those not hip to the cyberpunk vernacular) in order to keep the Runner from stealing the agendas for him/herself before they can be scored. There are four different Corps to choose from, and each plays significantly differently from the rest, from Haas-Bioroid’s beefy security programs to Jinteki’s deceptions and ambushes to NBN’s and Weyland’s significantly different approaches to the “tag and bag” style of play. The wide range of mechanics and emphases will accommodate most play styles in some way right out of the box and can be expanded in many directions with additional expansions. Each turn, the Corp player draws a card and gets three “clicks” to use for taking actions. There are many actions available, including gaining a credit or drawing a card, playing “Operations” (which give some one-time effect upon resolving) by using a click and paying the appropriate number of credits as printed on the card, or “installing” cards by playing them facedown on the table in columns called “servers.” Cards that can be installed include ICE, Agendas, Assets, and Upgrades. A server can have an unlimited number of pieces of ICE protecting it and an unlimited number of upgrades, but only one asset or agenda behind the server’s ICE. As long as they are face down, Corp cards are inactive and grant no effects. In order to turn them faceup, the player must “rez” them by paying credits equal to the card’s “rez cost” printed in the corner. When turned faceup, assets generally provide some sort of resource benefits, upgrades (obviously) modify the cards in that server somehow, and ICE protects a server. Agendas are the exception to the rule, and though placed facedown, they can’t be rezed like other cards. Instead, Corp players can use a click and a credit to “advance” an agenda. Once it has the number of advancement tokens on it equal to or greater than the number printed on it, it can be scored, netting the Corp player a certain number of “agenda points,” which are used to win the game. There are other cards that are advanceable, though, including assets, which gives the impression to the runner that this server contains an agenda. Some of these assets are even “ambushes” that cause damage or other negative effects when the runner accesses them. These ambushes (and some other card effects) often cause damage to the runner. There are three types of damage in the game: net damage, meat damage, and brain damage. Net and meat damage both cause the runner to discard a number of cards equal to the damage taken. They only differ in effects that can prevent one and not the other, and in the flavor of the damage source (net damage is, thematically, damage dealt by the Corp’s security systems while the Runner is jacked into their system, while meat damage is physical damage cause by real-world retaliation, such as sending goons to break the runner’s legs or something similar). Brain damage requires the discarding of cards, as well, but it also reduces the Runner’s maximum hand size by one for the rest of the game. The Corp player wins by scoring at least seven agenda points or “flatlining” the runner (i.e. making them discard more cards than they have or reducing their hand size to below zero). As you can see, the Corp player is generally focused on building up defenses, managing resources, and bluffing the runner. There are only three Runner factions (Anarchs, Criminals, and Shapers), but there is just as much variety available as with the four Corporate factions. The Runner, unlike the Corp, doesn’t get to automatically draw a card each turn, but they get four clicks per turn, instead of the Corp’s three. Runners can use clicks to draw cards, gain credits, play “events” (the runner equivalent of “operations”), and install cards. The Runner installs all cards faceup and has to pay the install cost in credits in addition to the click. Runner cards include Resources (generally generating credits or allowing card draws), programs (most commonly ICEbreakers, used to, ahem, break through ICE), and hardware (allowing more programs to be installed or boosting their effectiveness, generally). The Runner can also “make a run” on any of the corporation’s servers. If the server has ICE protecting it, the Corp can rez it and force the Runner to interact with it. The Runner uses ICEbreakers to interact with ICE, but only if the breaker’s strength is equal or greater than the ICE’s strength. Most ICE has multiple “subroutines” that the breaker must break in order to prevent them from triggering. This is done by triggering abilities on the breaker that generally cost credits to trigger, though some have alternative costs, such as clicks. If a Runner makes it through all ICE protecting a server without triggering an “end the run” subroutine, they get to access the cards within the server. If they access an agenda, they steal it and claim the agenda points for themselves. If it isn’t an agenda, they may have the option to pay a certain number of credits to make the Corp player discard the card, though some cards to not offer this opportunity. The Runner wins the game by stealing at least seven agenda points or if the Corp player must draw a card from his/her deck but has no cards left to draw. The Runner primarily focuses on managing resources, building up strong ICEbreakers, and reading their opponent. The deckbuilding is satisfying and somewhat different from card games that rely on an M:tG-style resource matching to play cards. Since all cards are played with clicks and credits, the faction-specific cards all have an “influence value” between 1 and 5. Depending on the identity you choose, your deck has a maximum of out-of-faction influence (most identities have a max of 15). This makes it easier to splash cards from another faction without worrying about being unable to pay to play them. There is a somewhat significant learning curve for the initial game for each side. There is a lot of terminology to get a handle on, which can be confusing to people who aren’t cyberpunk fans or are new to gaming. It doesn’t help that the same components for the Corp and Runner have different names. For instance, the Runner’s hand is called the “grip,” while the Corp’s hand is “HQ.” The player’s decks are the “stack” and “R&D,” respectively. The names are all highly thematic and make sense within that theme, but can seem unnecessarily complicated to some people. The asymmetrical nature of the game also increases the time it takes to learn, since the rules are fairly different for each side. It’s similar to learning two separate but related games at once, which can be overwhelming or confusing for some people, as well. Beyond those concerns, it’s simply a matter of learning the timing structure and when a player has priority to play abilities, which will simply take a few playthroughs. The priority system is relatively simple, though, which certainly helps speed this up. All told, within a couple of games, you should have the basics down, and from there it’s a matter of figuring out the optimal card interactions and how to read/bluff your opponent. As with most Fantasy Flight games, the tokens and counters are nice and thick, and the cards are of a good weight of cardstock and have a nice coating on them. The art is very evocative of the cyberpunk setting, but it is somewhat inconsistent. Some cards are phenomenal, while others seem a little weak. It also doesn’t help that the artistic styles of many of the artists vary widely, which keeps the game from establishing a cohesive feeling for the world. This may not be an issue for people who have played the other games set in this shared world (Android and Infiltration), but it kind of bothers me since I haven’t played those games. All in all, though, it’s a high-quality set of materials. I’ve played a lot of CCGs/LCGs in my time, and Android: Netrunner is the best of them, hands down. The gameplay is deeply strategic, and since it largely depends on bluffing/reading your opponent, simply changing opponents can drastically alter how you play. The variety of factions also keeps things fresh, as there are multiple themes within each one that players can gravitate toward as their playstyle may lead them to. The game is also incredibly well-balanced. While it may sometimes seem like one side is at an advantage, there are almost always ways to bring things back into balance. This really puts the emphasis on player skill rather than one side’s or faction’s dominance. It’s also worth noting that, while two core sets are recommended as with most LCGs, this game plays better with a single copy than most of the other ones. There are certainly cards that you’ll want more than a single copy of down the line, but to start with, you get a lot of variety and decks that run reasonably well, which is more than can be said for a lot of the game’s LCG brethren. In the end, if you even slightly enjoy card games, you should give Android: Netrunner a try. Its bluffing and getting into your opponent’s head, all while building your arsenal and managing your funds, makes for a commbination unlike any other game in an often too-familiar genre. If you’re a fan of the original Netrunner, you’ll notice some differences (most notably the Runner and Corp factions and identities), but it’s still the same great game it always was at its core and, if anything, the changes enhance the experience. If you missed out on the original, there’s no better time than the present to jack in to a great game. Is Netrunner all its cracked up to be, I mean how has it locked down the hotness section on Board Game Geek since its release basically never losing a top 3 position? Well I am here to help you make that decision for yourself. First I will give a brief overview of how the game is played, then I will compare it to the other LCGs I have played. Players take on the roll of either a Corporation or a Hacker (Runner) and their goal is to either advance your own goals/agendas (Corporation) or sabotage corporate plans and steal their valuable information (Runners). Each turn players get a limited amount of “clicks” which serve as your ‘actions’ for the turn. There are predetermined actions you can take or playing cards from your hand (Installing Cards) or activating abilities on cards in play requires ‘clicks’ as well. The Corporation player must ‘install’ agendas and place enough advancement counters on them to score the agenda points. In order to stop the Runner from stealing their ‘Agendas’ the Corporation player must install ‘Ice’ and ‘Upgrades’ in order to protect their Assets and Agendas. The Runner must steal agendas from the Corporation player, this is initiated by ‘starting a run’. During a ‘run’ the hacker will need to bypass the corporate security measures using ‘programs’ and ‘hardware’. If the Runner successfully makes it to the agenda and steals it, the Runner instead scores the agenda points. Corporations will also play ‘Asset’ cards to both help them achieve victory faster and mislead the Runner. The Corporation player will ‘install’ ice in order to protect their Agendas from being stolen by the Runners. In order to get past the Corporate defenses and protect themselves the Runners will need to utilize ‘Programs’ and ‘Hardware’. into a subcategory that specializes in breaking certain types of ice. Now that you have a basic idea of the types of cards I will demonstrate a hypothetical run. The Corporation player may also have multiple ‘Remote Servers’ where cards can be installed. There is a lot of terminology and since both players have different rules the learning curve for Netrunner is quite high. That is not to say that it is higher than other LCGs, if I were to rank it in difficulty out of the LCGs I have played, I would say it is the 2nd hardest to learn. In terms of the LCG matching its universe/theme, I think that Netrunner does better than all of the other LCGs out there. They did a really good job keep the ambiguity of each faction making sure to emphasize that there is no real ‘hero’, only lesser evils. The Game of Thrones multiplayer does a fantastic job capturing the treachery and backstabbing from the books, but I feel like the 2 player game lacks, so Netrunner has replaced Game of Thrones in this aspect for me. Until playing Netrunner, the Warhammer Invasion LCG was my go to 2 player competitive game. Although they play totally differently, they both feel very me vs. you and sometimes you need a game like that. Netrunner has replaced Warhammer for me though because the real world is becoming more and more like a science fiction movie each day and if you keep up with the latest technologies and research…cyber crime is already a issue and as someone who is anti corporation in real life, it feels nice to make their plans crumble around them. Netrunner almost feels like an evolved, better Call of Cthulhu, players compete over the same victory points and try to cripple their opponents enough that scoring the points is easy. I found that CoC had a run away leader problem and Netrunner did not, Netrunner is also just more fun. Casual Gamers: I think that LCGs make great games for casual gamers because they leave the option to expand and get more into the game without draining the wallet and more importantly without you burning out from the game itself. The advantage LCGs have with casuals is you can play it right out of the box but you can also make the experience what you want based on who you are playing with. Being able to appeal to different groups and ranges of gamers is important in casual friendly games. Gamer Gamers: This is where I think Netrunner shines. Because of the deckbuilding component LCGs do really well with Gamer Gamers, there is room to bend the games rules and really make your own strategy. The only thing that hinders Netrunner is its 2 player limit, but tons of choices, additional content, great gameplay, new mechanics and a large following makes Netrunner great for all avid gamers. While I love truly balanced games, asymmetrical games can be very fun as well (not that they have to be exclusive), and that’s what Netrunner is. One player plays a megacorporation trying to score agenda points and/or kill the pesky runner, played by the other player, who is trying to hack into the corporation’s servers and cause as much damage as he can while attempting to steal corp agenda. This game is strictly limited to TWO players as a result. The rulebook does a fairly good job of explaining things (one of FFG’s better rulebooks I’d say), and includes a helpful flow of play diagram on the back which you will probably want to leave face up the first couple of times you play. The quality of components is high as well; sleeves will likely be required if you care about keeping the cards in good condition, but this is true of most any card game. The tokens are made of very thick cardstock and will keep for a long time. Also, if you like to punch things out, congrats, you’re in luck when opening this box! While there are enough baggies included to both sequester all of the tokens, and initially separate the corp/runner cards, you will probably want to invest in something else to store the cards. This is doubly true if you are interested in building different decks. That being said, the box is more than large enough to both accommodate not only the included cards, but also cards you may purchase in the future. You will just probably need to get a little creative as the included cardboard support can probably only hold about double the cards you’re initially supplied with (if you removed it you could fit about 5 times that many, but they’d be free to fly around inside). A quick note: For those unaware what an LCG is, it is a format that Fantasy Flight has chosen to move to for their card games. Instead of booster packs containing a random assortment of cards from an expansion (sorted by rarity that give the cards differing collectible and monetary value), they release new material in 20 card increments, in packs that contain a fixed list of cards, with 3 copies of each (3 being the maximum number of copies you are allowed to include of any one card in a deck). This allows the game to grow and the environment to change without requiring you to spend a fortune to keep up (like with Magic: The Gathering). The expansion packs still have a MSRP of $15, however, so it isn’t exactly cheap either. To return to gameplay: the runner and corporation are governed by similar but differing rules. For example, the corporation can perform 3 actions per turn, but always draws a card each turn. The runner can perform 4 actions but doesn’t draw a card unless he uses an action to do so (this is a nice bit of theme attached to an interesting decision – I can totally see a hacker exclaiming ‘I don’t have time for this!’ while staying up all night to complete a run). The runner attempts to access corporation servers which include the corp’s hand, draw deck, and discard pile, as well as any additional server they create in order to try to score agenda points or host valuable resources. The corporation guards these servers with ICE, which have a wide range of effects that the runner must use certain installed programs to defeat. What becomes interesting is that while the runner plays their cards face up, the corporation plays their cards face DOWN, so what is on their side of the board is a mystery. The corporation can and often will attempt to bluff the runner into believing one type of card is another, and since running can be expensive, in theory this can force some tough decisions. After playing for some time, in practice many times it can be obvious for the runner what is going on, but that kind of metagame depends some on who you play with and your local scene. There are three different runner factions, and 4 different corporation factions. They all have a unique feel, and they are all adequately represented in the base set, which gives it a good degree of replayability. I will say that the base decks as they are suggested in the rule book (i.e. including only the cards of one faction and the neutral cards) will result in some matches being completely one sided. You will want to tinker with and substitute some cards (after reading the deckbuilding guide if you are new to this kind of game) in order to improve the quality of the gaming experience. Even after doing so, some of the corporation builds can feel woefully slow, it’s frustrating to be a supposed megacorporation and feel like you have absolutely no money! I’d say at this point the metagame highly favors the runner, but if you’re just looking for something to play with friends and don’t have interest in the game being absolutely balanced, this is definitely worth picking up, even if you don’t have any intention of purchasing any of the additional expansions. I’m not really into CCG or LCG. I don’t really like the idea of spending and spending and spending money to buy cards to be “better” player. But I do love everything that is somehow connected with cyberpunk theme. As there are very few board games (or RPG or even video games) set in cyberpunk-ish world, I decided to give Netrunner a try. I don’t really care about card trading, deck buidling and playing tournaments. I am what you may call a “casual” card gamer. And I must say that Netrunner is perfect for me. It’s assymetrical so depending on which say you choose, you get totally different goals and mechanics. The core set includes 4 corp factions and 3 runners factions, which is enough to have at least a dozen of different gameplays. When you add the possibility of deckbuilding – changing cards, mixing factions – you get a game that has the highest repleyabillity I have ever seen in CCG or LCG. And it’s all there in the core set. If you want to continue your hobby and collect expansions – go ahead, but if you don’t feel like it – you can still enjoy game after game after game and never get bored. What I really like about Netrunner is the way the game mechanics fit with all the “fluff”. It’s not like M:tG “OH BOY I CAST SUPER SPELL AND IT HAS THIS AWESOME EFFECT. IT DOESN’T REALLY MAKE SENSE BUT MAGIC DOESN’T HAVE TO MAKE SENSE”. In Netrunner, pretty much every card effect can be explained. When you do Stimhack you get hacking boost but – guess what? – steroids are bad for health and you get a brain damage after that. You want to weaken server’s firewall? You use a virus on a piece of ICE protecting it. The runner wasn’t careful enought and the corp traced him? Now he is tagged and can lose all of his precious resources (or can even get killed as corporation set fire to his apartment with Scorched Earth). To sum up – Netrunner designers did a great job putting fluff in nearly every game rule. Last but not least – game looks simply beautiful. If you watch Blade Runner or Ghost in the Shell over and over again, or can’t stop playing Deus Ex or System Shock – you will love Netrunner’s art and design. In a world… where money and power rule, net warriors look to take down the governing forces suppressing their lifestyles, general wellness and ruining their overall day. Hack the planet, boot up or shut up! Sorry, Hackers the movie gets stuck in my head whenever I think of this game. If it could have been be a board game or card game this would likely be it. Though much as I enjoyed what is pretty much an awful movie this is far far from an awful game!! 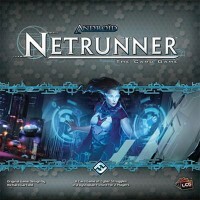 Set in the Android universe, Netrunner seeks to give the players a chance to either score agendas or steal them away by playing from the perspective of the corporations trying to set forth their agendas or from that of the runner attempting to sabotage their servers and steal those very agendas so they just can’t happen. As one of of the four corporations it is your job to protect your servers with ice and upgrades, while advancing your agendas and trying to stop the netrunner from getting at them. As one of the three types of netrunner you are trying to build a rig full of icebreakers, hardware and resources good enough to break on through and ****** them away before they can be scored. Both sides need to balance their income in order to purchase gear for the runner, or rez things for the corp and keep the other from getting to that almighty 7 agenda points to win the game. With the massive amount of data packs this game already has out and the others still to come there is a lot of value and replay here. In my opinion if you are a fan of deck builders and LCGs at all this is a no brainer to get. One of my fave games of all time. Great two player game with a totally different experience on either side leaves this one having a lot of legs. Thematics that just work with the mechanics so seamlessly that one really couldn’t go without the other here. A different coat of paint/theme just wouldn’t be the same at all. What I like: There are such a vast array of cards even just out of the core set that it makes for lots of fun once you start fine tuning and trying out new strategies. Who it’s ultimately for: Fans of Cyber-punk, Richard Garfield, card drafting, CCG/LCGs and anyone with a soul.. just kidding, everyone knows corp players have no soul, right? RIGHT?!! Who it’s ultimately not for: Non LCG/CCG fans, people who need to have every card in existence (okay, maybe it’s okay for them too but can get costly, though no where near as bad as CCG’s) and those looking for group games… this is two-player only folks. The game features beautiful art and the construction of the cards are very well done and intuitive. You play as either the runner or the corporation, each showcasing unique playstyle. As the runner you get to prepare your programs and hardwares to fight against the corporation’s ice which will try to stop you from hacking their servers. The corporation on the other will be defending most of the time against the runner’s attacks while trying to play his agenda cards. The goal is the same yet both players play a different game. To me runner was fairly easy to understand and play, you didn’t have the need to play slow and strategize, it was mostly taking a bet on wether the corp sets up a trap or is actually trying to defend a piece of agenda. The corp learning curve was fairly harder beacause you wanna play your agendas to score them but you really got to be careful and prepare in advance or else the runner an steal it, then again, the runner can try to steal it from your hands which makes it all the more harder to decide what to protect. The game is very fun to play and can last a couple of minutes if you make a mistake or last for about 40 min if both plays it well. Netrunner is a cyberpunk themed card game. This is an asymmetric two player game which means each player has completely different set of actions to perform. One has to assume the role of the corporation and other has to assume the role of the runner, who is a hacker in simpler terms. There are four different kinds of corporation decks to choose from and three different kinds of runner decks. Hence there are twelve possible matchmakings in this game. This shows the versatile nature of the possible gameplay. Primary goal of the game is to score agenda points, the one who score seven wins first. Corporation can score them by advancing the agenda cards. Only corporation decks have agenda cards. On the other hand runner has to score them by stealing them from corporation’s servers which can be possible by making a successful run. The corporation will generally install servers (agenda or asset) and protect them with ice. He installs all the cards face down and they remain inactive unless they are rezzed (flipping a card to make it active) by spending required credit cost. He can also utilize his clicks by playing operations which are specific to deck that he chose and can be used to perform different tasks. To advance a card it must be installed first. Runner can install programs or viruses that can help him to break ice and make his run on servers successful. There is a constraint on how many of programs or viruses he can install and available memory determines it. Initial memory space given is four units which is upgradable. He can also install hardware or resources which can benefit him in different ways. Unlike corporation, runner installs cards by facing them up and they are active from the moment he installs them. He can also play an event similar to corporation which is also specific to the deck he chooses. Main role a runner can play is to run on a server. To make a run successful he should break all the ices that are protecting that server. One important thing is corporation can see all the installed cards of runner while runner can only see the active cards that are facing up. This is one advantage that corporation has against runner. There is another way to win the game apart from scoring the agendas but specific to the role. Corporation can win the game if runner hand size becomes zero. On the other hand runner wins if corporation cannot withdraw any card during his turn in other words his R&D deck is empty. So player has to keep these things in mind. These are the basics on how to play which will definitely be insufficient to play the game. But this will give the insight of the gameplay. It takes some time to understand the game and pick the rules but it’s easy to ramp up. The rule book that they provide along with the game helps a lot. Runner need to gamble for the most part, he should be good at it. On the other hand corporation need to good at bluffing and setting traps. Runner has to guess the right server that has agenda cards based on corporation moves and corporation should lure runner into servers that doesn’t have agenda cards, called trapping. The most exciting part of the game is when runner makes a run on a server. Runner has no idea whether he is going for fruitful server or a trap. Player need to build proper strategy based on strengths and weaknesses of his deck and the opponent deck, and also opponent moves. This is what that makes this game very interesting and addictive. A good player knows about all the cards of opponent deck hence knowing its capabilities. The complexity, asymmetric nature and versatility makes it a great game to play and enjoy. Android: Netrunner is a cleverly built strategy board game which everyone must give a try who likes this genre. Android: Netrunner (A:N henceforth) is an asymmetric card-game set in the motif of a dystopian cyberpunk future. Player’s can take one of two sides: either that of the corporation, a powerful entity trying to advance an oligarchical agenda, or that of a runner, a vigilante hacker seeking to steal from the company and subvert its plans. Each side has a vast array of tools at its disposal to accomplish these goals. First off, let me say that this game is not designed for those who are novices to card-games. A:N was developed by Richard Garfield, most famous for his development of Magic: The Gathering (the first ever collectible card-game, released in 1993), and Lukas Litzsinger. The complexity of the game represents a significant upward step from the difficulty and complexity posed by MTG. In fact, that is my biggest negative critique of this game. The difficulty, complexity, and terminology create a large barrier to entry for new players, even those who have experience with other collectible card games. The rulebook for the game is incredibly long: it’s about 40 pages, in a large-form manual with pages about the size of 8.5” x 11” (no, I didn’t get my ruler out to measure this). First, due to the asymmetrical nature, each of the two sides has different terms for what amounts to the same thing. The corporation, for example, has four major sites that it must defend: HQ (the hand), R&D (the deck), archives (the discard/trash pile), and servers (in which the corporation can play assets, agendas, traps, and other things as well), with “ices” (defenses) placed in front of each of these cards to defend against the runner’s attacks. The runner’s side is composed of the stack (deck), grip (hand), heap (discard/trash pile), and rig (composed of programs, hardware, and resources. I won’t be able to get into all the complexity of the game in this review, but this gives a little sample of the initial difficulty. The asymmetrical nature of this game is its biggest selling point. Each of the two sides feel incredibly different in terms of gameplay. The runner plays the aggressor in the game, making runs on the corporation to destroy its defenses and steal its cards — the primary win mechanic for the runner is to steal enough cards called agendas. The runner’s deck is constructed to sabotage the corporation and get access to its valuables. The corporation, on the other hand, is constructed to defend against these runs and/or to punish the runner when he/she tries to make its runs. There is also asymmetry in terms of information. The runner plays all of its cards face up, revealing whatever nastiness it has available to the corporation. The runner’s grip and stack remain unseen. The corporation, on the other hand, plays many of its cards face-down, and these face-down cards can have some incredibly dangerous features on them. All ices are initially played face-down, although they have a rez cost, meaning the corporation must pay to bring them online. Certain corporation cards are worthwhile for the runner to attack and steal, but others are traps, which can damage or kill the runner, ending the game. Gameplay consists of turns: the runner has 4 actions, which include drawing cards, getting money, playing cards, and making runs on the corporation’s servers; the corporation always draws a card and begins with 3 actions, which include drawing cards, playing cards, getting money, and advancing agendas. In my experience, the runner seems to have an advantage early in the game, before the corporation has deployed its defenses, but the corporation starts to become more powerful later in the game. This may merely be a function of the limited number of decks that I’ve played. It seems, though, that decks can be constructed either for early-game advantage or late-game advantage. Over time, the runner can build up a significant arsenal of programs to overpower the corporations ices, but similarly the corporation can stack row after row of defenses on each server. Early on, it is unlikely that the corporation has set up any nasty traps, and the runner can attack with relative freedom; as the game progresses, however, the danger of each run increases, as well as the cost to the runner to make them (i.e. in order to pay to overcome the corporation’s defenses). Personally, I enjoy playing the corporation more than I enjoy playing the runner. On the side of the corporation, there is a large element of deception in the gameplay. Cards come face-down. Traps are advanced by the same mechanic as agendas, and so the runner cannot necessarily tell which cards are which. Some of your servers may have incredibly strong defenses, and some may be weak, but the runner cannot know without making the run against them. Lastly, I wanted to point out that A:N is a living card game, meaning that its producer, Fantasy Flight Games, is constantly creating new cards with new abilities. New decks and builds are always coming out. This creates a very immersive environment for players who want to get involved in the game. There is an enormous online community built around the game and its strategy. Overall, despite its high barrier to entry, A:N makes for a compelling game with hours upon hours of potential gameplay. If you’re willing to tackle the difficult learning curve, A:N is worth the try. Android Netrunner is a Living Card Game (LCG) designed by Richard Garfield and Lukas Litzsinger and published by Fantasy Flight Games. It is a two player strategy card game. The game is set up in a cyberpunk dystopian futuristic theme, where the Runners (Hackers) try to acquire the digital independence by hacking into to Mega Corporations servers, who controls every facet of daily life, like food, music and career choices. The Runners try to reveal the evil intentions of the Mega Corporations. Android Netrunner is a two player card game where one plays as a Runner (hacker) attacks the corporation servers with his software, hardware and resources. On the other side, second player plays a Mega Corporation, who tries to stop the Runners attacking on their servers, tracing them and advancing agendas. Generally, the gameplay of Runners is more of attacking mode and the gameplay of Mega Corporations is a mix of both defensive and attacking mode, in which he has to carefully decide, when he should attack and when he should defend. There are total seven factions in the game with different abilities which are mentioned on the card. There are four Corporate Factions and three Runner Factions. A player who scores seven agenda points wins the game. Corporations have to score them and Runners have to steal them. A player who succeeds in doing first wins the game. If the Runner Flatlined (having no cards at the end of his turn) Corporation wins. If Corporations runs out of their R&D and any point then the Runners wins instantly. The gameplay is asymmetric as both players play their cards differently and even the setup of Corporations and Runner is different from each other. The play progresses by counting the number of clicks both Corporation and Runner plays. Corporation have three clicks and Runners have four. The main actions of corporations are install an agenda, assets, upgrades or a piece of ice, trash the runner’s resources, trace him and make him stop the run. The Runners main actions are to install his Rig with programs, hardware and resources. The Runners get credits from the bank to install their rig. There are different kinds of cards, which have different meaning in the game, like identity card which is present in each different faction. 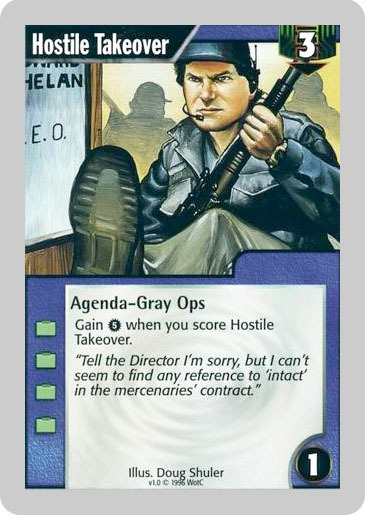 In addition to this for Corporation there are cards like operations, agendas, ice, upgrades and assets, each have different roles in the play. In Runners, in addition to identity card there are hardware, resources, programs and events card. There are also Neutral cards, which helps in deck building. Deck building is most crucial part in the game as it gives the new experience every time you build a new deck. This way every time you play the game with different factions and different cards you will have new strategies and experience. To get a hang of how you should build you deck you must have a general idea of what various cards do. First game experience of the Netrunner was complete fun. We both do not know how to play, even though we read the rules of play from the book which were a plenty. The first game we end up constantly referring to both rules book and also to online tutorials. We switched the teams for next game and recollected all the rules that we learned from book and as well as from online tutorials. Once we got the hang of it, it was lot more fun, runner trying to run on the servers and me stopping him and me trashing his rig. It is all about getting a good start, when you are picking the first five cards after shuffling. Shuffling almost decides you win the game or loose. If all your agenda cards are stuck at bottom and you run out of all other cards, it becomes hard to win the game, which happened with me in the first game. It is also important how you build your decks, which brings the variety and new strategies to the game. This is my first time playing a card game and that too asymmetric card game. It was bit tiring process to learn new terminology and remembering them. Once done with learning the new terms, you have to study book full of rules and how to play the game, which is a bit frustrating. But once you get to know how to play the game and deck management it’s really a fun game to play. I really enjoyed playing with corporation and controlling all the strings and the right time. I like the artwork and graphics of the game as it rightly sets to its futuristic dystopian look. I really liked the concept of deck building from different sectors, which open up the game play vastly and creates interest. I rate this game 5 on a scale of 5. Though first one or two games are bit tiring and frustrating, you will love it if you get a hang of it. I definitely recommend to play this game, if you are a card game lover and looking to play some interesting strategic card game. Lots of rules to study, in order to play. Android: Netrunner is a card game originally designed by Richard Garfield that is based on a fantasy dystopian future of the Android universe. It’s a two player game where one player takes control of the evil “Corporation” and the other takes control of the “Runner”, a genius megamind hacker. Netrunner is an intense game where players can get completely immersed into the fictional environment and go head to head to gain the upper hand. Chances are that you’ll forget to grab a cup of coffee when you actually start playing! In Netrunner, two players battle each other out to gain control of “agendas”(special cards) which has points on it. First player to score 7 or more points wins the game. The role of the person playing “Corporation” is to advance their agendas as far as possible. In contrast, the role of the person playing “Runner” is to hack into the corporation’s agendas and score points. The most intriguing aspect of Android: Netrunner is its asymmetrical design. By asymmetrical, I mean to say that both players will have entirely different roles to play and each player will have different cards and objectives. This concept makes it an exciting, tensed and forehead sweating card game where players have no time to relax. Each action can have consequences in the latter part of the game. The game begins by first selecting the role the player wants to play, i.e. as a Corp or as a Runner. The Corporation gets 4 clicks (chances) per turn and always goes first. First click is to draw a card from the deck. In every turn, the Corp player has to draw a card from the deck without fail. The rest of the clicks can be spent on various activities like installing (placing) cards on the table, protecting the “trump” card (which may/may not be a points scoring card) by installing firewalls, which are called “ice” cards. There are three kinds of ice cards through which you may protect your trump card, “barrier”, “code gate” and “sentry”. The clicks can also be spent to gain credits (coins) or drawing more cards from the deck. In addition to the above mentioned possibilities, a Corp player might even set up a “trap” and make it look like it’s a trump card and try to put as many ice cards as they can in the hope that the runner might fall into that trap and face consequences written on that card. One interesting thing that I forgot to mention earlier is that the Corp player places its card face down. That means only the Corp player knows what’s in that card and the Runner is completely unaware of the identity of those cards. But there are several one-time “Event” cards where the runner can uncover the identity of any card of its choice provided the runner chooses to install that event card. The runner’s job is to attack those Corp player’s servers by by-passing any barrier or ice-cards that the Corp player has installed. The runner bypasses ice cards by installing programs (cards) of the same type as that of the ice-cards installed by the Corporation player by paying the same number of credits written on that program card. Similar to Corp player’s click options, the Runner can also spend their clicks on drawing more cards from the deck or gaining more credits. In addition to program cards, there are various other cards available to use like Resource cards, Operation cards, Event cards etc. where the runner can even trash specific cards by paying credits if the card has a trash value. Netrunner is all about strategy. Hence, optimal use of resources is of utmost importance if have any chance of winning. As a former Magic The Gathering player, I knew I could trust Richard Garfield with his new deck building game, but I wasn’t expecting such phenomenal experience. If you never felt the tension of hacking/being hacked before, Android Netrunner is here to show you that internet is, in fact, serious business. One of the players will be assuming the role of a Runner (a hacker) and the other will be a Corporation (a company that holds important information). There are 3 different decks of runners and 4 of corporations, which gives this game great replay value. The objective of the game is to achieve and “perform” one specific type of card: the “Agendas”. Agendas are like really important information located in the Corp’s Research and Development Server (aka the corporation’s deck). Following the same concept, the corp. player’s hand is also a server, as well as his discard pile. The runner must access all these servers by spending one of his actions in order to steal the agenda cards. Each agenda has a specific value, and whoever score 7 Agenda points first wins the game. Sounds simple right? Well actually the Corporation can create new servers by placing cards faced down on the table, this cards can be agendas or traps, so if the runner try to access these new servers, he may score points or suffer the consequences of encountering a trap. So expect A LOT of bluffing when playing Android Netrunner! Really cool mechanic! Also, the Corp. may install defenses in its servers, preventing the runner to a gain access of the cards or even tracking him down and punishing him. And the runner of course may install programs, hardware, software and everything he can that may disable the Corp’s defenses. The quality of the components are marvelous! Even the box feels prettier than other games I own! I know this is the quality expected from Fantasy Flight Games, but everything in this game was really well made. Congratulations to everyone involved! Bottom line is… the theme of Android Netrunner is brilliant! It makes you really feel as a hacker or some big fat corporation struggling to keep its servers secured! Every gamer should play this game and feel this experience. If you are not familiar with deck-building games, don’t worry! All decks in the base game come ready to play! Also, Fantasy Flight Games has an AWESOME tutorial video on its website, teaching every step of the game! The manual itself is pretty good too! So, the only reason I didn’t give my first 10 grade ever to this game is because it is a 2 player game only, and I wish there was a variant for 4 or more players. That’s the only reason! I loved this game and I thought I wouldn’t play deck building games so soon. But this one is a “must play”. Android: Netrunner is a remake of the Netrunner CCG (Collectible card game) from the mid 90’s. This version is a living card game as opposed to a collectible card game, based around a cyberpunk theme. The game is a 1-on-1 battle between a mega-corporation (Corp) that is trying to control the world through technology and a genius hacker (Runner) trying to expose the data and secret agendas of the corp.
First off, the game has a really steep learning curve. If you have never played card games before it may well be 5-7 games before you can understand the gameplay. However, once you do the game turns out to be really fun and you just can’t stop playing. There are an overwhelmingly large number of rules to understand, not all of which are mapped out clearly in their 36 page rule book. In keeping with their theme all the cards are also named differently; trash pile is archives, draw pile is R&D, any agendas or assets you install are placed in remote servers and your hand is called the Grip for the runner and HQ for the corp, all of which follow a standard format for placing them on a tabletop. A player may play as Corp or Runner (card on right shows runner Kate “Mac” McCarthy). The objective of the corp is to progress its secret agendas and score points for each agenda it advances. The corp uses several layers of protective ice on these agendas to prevent the hackers from getting through. The hacker (runner) has to break through the ice to reveal these agendas, in turn scoring them for themselves. The runner uses a host of programs and hardware to support this to help them break through. The first one to 7 points wins. Due to the asymmetrical nature of the game the corp has a more ‘come at me’ defensive attitude while the runner plays as the attacker. This suits different players and play-styles well. Resources are available in the form of clicks (4 per turn for the runner, 3 for the corp) and credits. A runner has additional resources like memory and viruses which constrain how many programs can be run at a time. When the corp installs a piece of ice or any agenda/asset he installs it facedown so the runner has no idea what it is until he makes a ‘run’ on the corp and encounters it. This makes for some very creative mind games and bluff tactics. Each of the base decks have some distinct and unique advantages that require you know the strengths and weaknesses of that deck and turn them to your advantage. Starting out learning this game by yourself is hard. Due to the steep learning curve for the game, players with different skill levels make for some really boring games. You want to get some experience playing with someone at your own level of experience when trying to learn the game. As with most card games luck plays its part in the game. However the structure and pace of the game is such that even if you get lucky in the beginning the game doesn’t spiral out of control. There is ample opportunity for the unlucky player to make an amazing comeback in the game. Thus balanced gameplay really impressed me and is probably what makes netrunner so balanced in spite of its asymmetrical style. Another thing that really draws you into the world of android netrunner is the artwork and the quotes at the bottom of each card. Drawing out your Giordian Blade (It can slice through the thickest knots of data) program and ripping the opposing code gates in half to sail your way through to capture a well advanced agenda is very satisfying. However, one problem which happened a few times when I played netrunner is that sometimes the game may get really drawn out when after a while nobody is drawing the right cards. Especially since the corp controls the majority of the flow of the game, the game may just be a credit-rich runner making endless runs on HQ and not drawing anything significant. Although this occurrence is rare if the game is in its nascent stage it can make the game extend well over its hour long standard play time. In closing, great artwork and well balanced gameplay is what makes Android: Netrunner a very fun and engaging experience. Though the time commitment is high, it also makes winning more rewarding and forces you start strategizing about your next game. Making custom decks and seeing how they play out is another great experience netrunner delivers. Netrunner is a game you can sink hours of play into and be left wanting for more. I come from a background in computers, computer games and card games like MTG and L5R. When I first saw net runner I was turned off because thought that it would be really hard to get into because I don’t have any particular interest in the Android universe. The rulebook was too long and the key words were too numerous. It was a bit intimidating but after finally taking that initial dive into the game I am glad that I did. Here is a little about my experience with net runner. Netrunner does an amazing job of creating a unique experience for the player. Playing as either the corporation or the runner will give you a huge change in play experience. Furthermore, each faction inside of each role also plays differently. For example, I enjoyed my games as Weyland Consortium as I raked in the credits and over ran the runner and likewise I had a great time with the traces found in the NBN deck. I also really enjoyed the art and layout of the game. My favorite art is on the Jinteki cards with its Japanese art feel complete with samurai looking Ice (neural Katana) and anime feel of the Japanese business man (Zaibatsu Loyalty) and the art on Akihiro Watanabe. The game overall had a great theme that made sense (after tackling the rulebook). The most compelling thing about Netrunner is the replay value. After my first game I was pleasantly surprised at how eager I was to try again. It really sucked my in and now I am trying to get my own custom deck together. The depth is just right to be elusive enough to intrigue me while be simple enough for the general idea of the game to sink and hook me in rather quickly. The biggest negative criticism I have though is related to that depth. I feel that it is a bit hard to understand and that explaining the game in simpler terms might appeal to more players for example, the runner has built in mechanics (runs) to search and access any of the corporations’ cards. His goal is to access a certain type of card called an agenda. A simple explanation like that could have helped me to get into the game easier. Instead, I spend a few games completely clueless to the basic mechanic of the game because it was clouded by the mountain of rules. I couldn’t see the forest for the trees. I think this could possibly be a marketing problem. Another problem that compounded rules problem is the thematic naming of every part of the card game. Want to discard a card as the corporation? Instead put in in your archive. Want to talk about your opponent’s hand? You better learn the difference between HQ and grip. These terms make it a challenge to look up the rules and to decipher them, which admittedly happens a lot even now that I have a fair few number of games under my belt. Finally, I felt that some of the core decks are a bit underpowered when compared to each other. For example, playing a game against NBN, I didn’t mind getting traced because that deck has very little that it can do to a tagged player. Furthermore Weyland Consortium has access to a total of 6 cards that access its identity trait. It feels so underpowered that I might as well be playing some other deck. I guess this can be good because it forces players to change their decks if they want to play seriously, but it can be frustrating for a first time player when they learn that their deck does nearly nothing against an opposing deck. +Unique Experience for each role and even each faction. +Amazing depth and replay value. -A little hard to get into at first due to massive amounts of rules. -Goofy names for common game parts like Archive instead of discard pile. -Core set decks are mediocre. If you are looking for a fun game that will give you hours of entertainment, then I recommend Netrunner. Just like the hit series “Lost”, you will need to stick in there for the first little bit to get past the set-up stage, but once you do it is amazing. Best of luck and hope to play against YOU soon! The first time I played Magic: The Gathering, I drew nothing but land and got demolished in a handful of terms, and didn’t touch the game again for a year. The next time I played Magic: The Gathering, I drew nothing but cards I couldn’t play without land, and received my killing blow within the first dozen turns. I haven’t played Magic: The Gather since. So when I was told it was part of my class assignment to play Netrunner, a Living Card Game, I was highly skeptical that it could be at all enjoyable. I’ve never been happier to be wrong. One of the best aspects of Netrunner is the reduction of chance from your deck. Since there aren’t different rarity measures for cards (i.e. the same cards are in every expansion pack), everyone is on equal footing (at least if you’re playing someone with the same expansions, or a straight-out-of-the-box session). Additionally, actions players can take with their different “clicks” (essentially, their action counter for each turn) facilitate something happening to advance your cause every turn. Clicks can get you cards, money to place cards, or “attacks” against your opponent. While there is a reduction of chance from the cards in your deck and hand, the unknown factor comes in based on player bluffs or misdirects which is one of my favorite aspects of any board or card game. Naturally, it’s harder to bluff or read bluffs if you’re new to Netrunner, but learning techniques from experienced players, or realizing that you should be bluffing or juking your opponent more, makes learning the game fun as well. My critiques for the game are the same as just about every other review on the internet for Netrunner. The rule manual is a chore to get through, and the terminology overcomplicates the basic mechanics. Having said that, the terminology contributes to a world and theme that is hard to beat in any other LCG or board game, so calling for it to be removed entirely could cause some serious drawbacks. The devil’s advocate in me wants to point out that with such specific terminology, identifying play and cards and actions for each player later in the game is supremely easy once you’ve mastered the jargon of the Android universe (which only takes a handful of play throughs in Netrunner). I’m also not sure why Fantasy Flight Games didn’t simply include a piece of paper with a link to their YouTube video that walks through the game play. Not only does it explain all the rules more concisely and clearly, but it’s good marketing material; the video makes the game look as exciting as it is, whereas the rule book makes the game seem like a chore. Another barrier to entry is that it seems like the worse both players are at Netrunner, the longer it takes to play. If both players are experienced, a round of Netrunner takes, roughly, the advertised thirty minutes. If one player is experienced and the other player is a novice, the game is over very quickly, as one player gets demolished in about fifteen minutes. If both players are novice, expect it to take at least an hour, due to referencing the rule book over and over again. If nothing else, FFG should manufacture some cheat sheets for quick reference. There are action reference cards for each role (Runner or Corporation) but a little more detail about card arrangement on the playing surface, as well as some details about the types of cards in your hand would be supremely useful. Another caution is that while this may seem exciting for couples since it is a two player game, be sure your significant other is in for the long haul; Netrunner isn’t a great entry game for novice gamers, or anyone you’re trying to convince to play more board games, since it can take so long during the first game (if your significant other loves theme then this might be just as good as any other game to try to baptize them in the game culture). But let’s sandwich in these critiques by rounding out this review with more reasons why this game should be played. The asymmetrical play I highlighted very briefly above is brilliant. At the very least, if you end up discarding the game, you feel compelled to play at least four rounds – a novice round as each occupation (Runner or Corporation) and then at least one more round in each role, to really get a feel for the game. Then, you might hate it, but that’s a great value right off the bat. The art is also beautiful. I’ve never felt compelled to get involved in deck building games, and yet I find myself reading and theorizing about how different cards could work together because the artwork is so beautiful to look at in the first place. All in all, this is a game well worth the money – you will continue to get the bang for your buck for years to come, just from the out-of-the-box decks. Cyberpunk. There, now you understand Android: Netrunner. Android: Netrunner is an asymmetrical, 1v1, living card game from Fantasy Flight Games. It is based on the 1996 card game, Netrunner, by Richard Garfield who is best known for designing Magic the Gathering. I’m going to avoid specifically spelling out the rules of the game, except where they are relevant to reviewing the game, as you can learn to play from any number of online sources. Now, back to my first sentence. Android: Netrunner is game about embodying a cyberpunk character, in the high-tech, low-life future.ss Either someone who is running an insidious corporation, trying to push agendas, or a hacker (known as a runner) trying to break in and steal those agendas. I’ve never played a card game that captures its theme so well. Everything in this game makes you feel your role, from the card art, the mechanics, to how your play area is laid out on the field and the naming of each of the game’s locations on the field. The corporation doesn’t have a hand, deck and discard; it has HQ, R&D, and the archives respectively. Likewise the runner has a grip, stack and heap. All this terminology is a hurdle for new players, however it aids the player is engrossing within the setting. During play, each player’s play area is organized differently. The runner’s area is called a rig, with sections for programs, hardware, and resources. As the game progresses as a runner, you feel like you are building this epic computer to hack through the corporation’s defenses and steal agendas. While the corporation is spending time being defensive and protecting itself, you are always the one to attack. The runner is always the initiator, and always has the last say in how he reacts to a situation. On the flip side, as a corporation, your play area is comprised of remote servers. Each server can have an agenda or other asset loaded into them. In order to stop the runner from just hacking in and steal them however, the corporation can install firewall-style programs called ice. Ice are installed in front of a server, essentially representing a wall the runner must make it through to their goal. As the game progresses for the corporation, you are installing more and more ice, and nefarious agendas. You quickly grow from a small vulnerable corporation into a massive, nearly unbreakable structure. Both sides of Android: Netrunner are unique and feel their part. However this awesome setting and theme does not diminish the quality of the game. Some elements of Netrunner are much more open than in other card games. Each turn, each player has a number of ‘clicks’ they are free to spend as actions. A click could be placing a card down, or drawing a card, or gaining a credit. This choice really opens a wide range of possibilities to the player, and allows some great play dynamics. You are no longer limited to drawing a single card and just having to live with what you have that turn in a card game. Players can choose to draw cards for their clicks, if they don’t have a good hand, or gain credits if they are low. I’ve also never played a card game where I felt this in control during the entire duration of play. Even if you are losing game, being able to perfectly manage your clicks each turn is very rewarding. Android: Netrunner is absolutely a game that can be played by a plethora of players. With the living card game format, players are not troubled with trying to collect cards. They know exactly what they are getting with the core game, and each expansion pack. It is definitely a hard game to get into, with the many rules and nuances of play that are common to these types of card games. That is only compounded with the use of unusual naming conventions for many of the core elements of a card game. Finally I can’t really recommend Android: Netrunner enough. The game is loads of fun from either side of the field, with unique gameplay to boot. It grants players an unparalleled level of freedom with how they handle their individual turns. Most importantly, for me at least, it makes me feel like I am embodying the spirit of a cyberpunk justice warrior or an evil bureaucrat. Have you ever imagined yourself being a hacker breaking into computer and installing deadly viruses to bring down the evil big wig corporations who control and decide how humans live in a futuristic society? Or have u ever wanted to be a megacorporation that will shape the society and contribute in developing it by preventing criminals and hackers from stealing you agendas? Netrunner is a cyberpunk themed Living Card Game (LCG) by Fantasy Flight games which takes place in a futuristic android universe. It is a remake of 90’s Netrunner Collectible Card Game (CCG) which was designed by Richard Garfield. This is a 2 player game where one of the player plays as The Corporation and the other as The Runner. The game is asymmetric, meaning both the players have a different set of cards and play very differently, yet they have a common goal. To win! Corporation has 4 factions namely Haas-Bioroid, Jinteki, NBN and Weyland Consortium. Runner has 3 factions – Anarch, Criminal and Shaper. Both the players are supposed to select one of his side’s factions and select the deck cards accordingly. The decks are customizable which I liked about the game. The Runner on the other hand wins by stealing agendas to a total of 7 points or if the Corporation runs out of cards in his stack (R&D). Corporation progresses his game by scoring his agendas and protecting them from the player. He does that by securing it with the Ice, a barrier, which contains subroutines which the Runner has to encounter when he makes a run on a remote server. If the Runner stops the run (Jack out) before the Ice is revealed (Rezzed), he does not suffer any damage, however if the ice is Rezzed and if the Runner does not have an immunity or programs to encounter the subroutines in the Ice, he has to take them and suffer the damage. The Runners job is to attack the Corporation by making runs on his various remote servers, his hand, his stack and even his trashed cards called the archives. Corporation plays by keeping his cards face down to bluff and lure the Runner into thinking that he has installed an agenda. Runner on the other hand plays all his cards face up and has to be aware of the Corporation’s dirty tactics. Both have to make sure they have enough money (credits) to perform various actions. So both the players are supposed to spend their credits wisely. In short the corporations attitude towards the game is “Bring it on!” and that of Runner is “I am making a Run!”. Before playing the game I wasn’t very excited about the game since I have always found card games boring and time consuming. But since I had to play it as a part of my school assignment I unboxed it. I really like the art work, it gave a feel of Blade Runner in hand. It took quite a while for me to understand the game since the contents of user manual were strewn across the pages. I played a couple of games and started enjoying it, I mean I loved the game! I started playing the game as a Runner and was very bogged down and agitated the time I played as the Corporation. I guess I did not know the corporation tactics well enough. I like being a runner, being a Runner feels like a cat in a cat-mouse chase game. Loaded with viruses and programs to break through the barrier of the corporation. The feeling when you break the Ice and obtain the agenda is just speechless and the look on the Corporation’s face is pitiful. It is not really fun if you do not customize your deck. You might be able to play fairly OK. Customizing the deck gives you more power and align the cards to your strategies. Netrunner has a huge fan base, you will not have problems with finding the game materials and updates to the decks. The only thing that I did not like about Netrunner was its huge learning curve. It took me a while to really understand the terminology. It requires at least 2-3 games to get well acquainted with it. Also, it is a 2 player game so you cannot really play it with a group of friends. Overall the game is amazing and it has really got me hooked. I recommend this game to everyone. You will definitely get bang for your buck with the new out of the box decks which fantasy flight games releases. Whether playing as a scion of regimented order or of creative anarchy, the dichotomy proposed by Android Netrunner offers intriguing possibilities. Android Netrunner is a two-player asymmetrical attack-defense game. Like many asymmetrical games, the learning curve is steep, and feels somewhat isolating, because there is little to no visual feedback occurring while watching the other player in action. Your success and learning process, unless aided by someone who already knows how to play, will be determined entirely by your own ability to read, synthesize, and utilize the rulebook. Speaking of the rulebook, it is relatively lengthy and fairly detailed. I got the feeling the designers organized it as best they could, but was still left frustrated at times as I tried to figure out what the heck was going on. And this really leads to the primary criticism of the game—it is pretty brutally difficult to learn. If at all possible, I highly recommend having someone who knows how to play give some instruction the first couple times you play. However, once you conquer the initial, treacherous ascent, you are greeted by a surprisingly intricate, balanced, and fun game. In other words, it’s worth the challenge. Because the game is asymmetrical, I think it’s worth it to discuss the separate player roles in to establish the gameplay foundation. The two roles are that of the Corporation, controlled by one player, and that of the Runner, controlled by their opponent. The Corporation: The player chooses a single corporation from among four options. Each of the corporations has a distinct tactical ability and advantage, which in turn lead to distinct play styles and strategies. The Corporation may win in one of two ways: first, they may utilize agenda cards, which must be placed in the playing field, and “advanced” (a game term meaning that money and actions must be spent building up the card until it matures) the designated number of times in order for the card to activate, thereby giving the Corporate player points. Alternatively, the tricky Corporation (some are better at this than others) can actually damage the Runner, and if sufficient damage is dealt, the Runner is defeated and the Corporation wins. The Runners: The running player chooses a faction from among three available running styles—the anarchist, the criminal, or the shaper. Runners win the game by stealing agenda cards that have not yet been fully activated. Alternatively, the Runner wins if they outlast the Corporation—meaning that if the corporation’s draw pile runs out of cards, the Runner wins. In order for Corporations to keep Runners from stealing everything, Corporations use cards called “Ice”, which protect corporate assets, such as agendas. In turn, Runners build up gear, programs to break through ice, and stockpile assets to help them get through the Corporation’s defenses and steal the assets. The game is entirely asymmetrical—the player’s have very different strategies, roles, and cards. Key to understanding how this works together is the idea of hidden information because at its heart, Netrunner is at least as much about reading the other player as it is about the cards in your hand. Corporations are not required to play their cards face up when placing them on the board—in fact if they were to do so, they’d probably lose every game. Instead, many of the Corporations cards, such as Agenda and Ice cards, are played face down. Now Ice cards are always positioned perpendicular to the cards they are protecting, so the Runner knows it is an Ice card, and that some sort of (hopefully) asset is behind it, but the Runner does not know: how strong the Ice card is, what is required to pass it, or what will happen if they fail. Only when the Runner makes the run are the Ice cards revealed as they are encountered (assuming the Corporation doesn’t just let the Runner through). Similarly, the cards protected by Ice may be Agendas or other Assets, but some Corporations also have Ambush cards, so the Runner attempts to steal it, breaks through all the Ice, and then has the Ambush card blow up in his or her face instead. Reading the other player is therefore just as critical as knowing the cards. For instance, if you know the player chose a Corporation full of ambush cards, then you need to be more careful. Similarly, if you, as the Corporate player have many ambush cards, its best to spread them widely, protecting each of them (and your Agenda cards) with minimal Ice. The game then becomes a shell-game of each player trying to game the other. It’s both challenging and engaging. There are many other rules we could spend time talking about, but honestly I think they are more peripheral issues than essential ones. At its core, this game is worth the time and the investment. The initial learning curve is steep, but once you’ve conquered it, the game mellows a fair bit. Lest you think that the magic is then gone, however, it is important to note that this is a deck-builder, and that once you’ve gotten a feel for the game, you may find yourself editing your decks a bit to polish the razor edge of your play style. Netrunner is a card game calling itself a living card game (LCG), which means it’s an expanding card game but unlike collectable card games(CCG), such as Magic, these expansions are sold in non-random booster packs. 2 player game. One person plays as a Corporation while the other plays as a Runner. The goal of the game is to score 7 agenda points to win. To score agenda points as a Corporation you must advance agenda card. To score as a Runner you must steal agenda cards. There are other ways to win as well, such as getting the Runner to hold no cards, or getting the Corporation to run out of cards to pick up. Because this is a short review and I want to talk about the pros and cons of the game if you want details on how to play read the instruction manual or another resource. I really like the deck building. Having the ability to use other fraction cards in your own deck leads to many different layouts and having a limit of influence (how many other cards from other fractions you can have in your deck) really making picking those last few cards a hard choice. I also enjoy the attack vs. defend style of game play. The Runners are almost always on the attack while the Corporation is playing defensively. The fractions are mixed up enough to give each one a different feel of play. Having the ability to win the game different ways also helps in different game strategies, as an example playing a Corporation with the ability to do massive damage to the Runner and winning that way instead of trying to score agendas, or as a Runner playing very passively and trying to get the Corporation to run out of cards. It adds a bit more depth to the game. Having two different sides using two different terminologies causes a longer learning curve, which could have been handled better. I noticed on my play through with the Corporation that I had long periods of time where there was nothing I could do, I had no agendas down to advance, and I wasn’t picking up any ice, so I had to just take more credits and pass my turn. The 30 page instruction booklet is great at helping a new player set up and understand the basic play but it does a subpar job of explaining some of the more advanced things in the game. One major example is the Runner’s card Crypsis. The directions on how to use the card are vague and talking with my peers many used the card in different ways. Another frustrating example is when a Runner starts a run and approaches the first piece of ice. “The Runner cannot jack out while approaching the first piece of ice during a run. ”An icebreaker can only interact with ice that has equal or lower strength than the icebreaker.” So if the Runner doesn’t have a strong enough icebreaker then they take the ice’s hit, but if that ice doesn’t have a subroutine “End the run”, the Runner gets to continue onto the next ice. Again, if the Runner’s ice isn’t strong enough to interact with the ice they take the ice’s subroutine and again, if the ice doesn’t have “End run” then the Runner continues to advance. If I am correct on the rules of game play, then many of the ice’s strength do not matter. This is especially frustrating with NBN Corporation which has almost no ice that ends a run. I had to learn this the hard way because I originally misread the rules and thought a Runner couldn’t pass ice unless they had an icebreaker strong enough to pass (I created my deck based on this idea). Looking into the rule book resulted in the two references I used, which are not helpful. Going on-line didn’t help much either other than one post that said interacting is not the same as approaching. The setting and art for the game are really well done (even if most of it is ripped from the book The Necromancer). The game play has many levels which I can see being very compelling to many. The game allows many different ways of play and strategies but has a deep learning curve with not the most explained directions. To fully understand the depth of each fraction (and rules) a player will need to play each one many times to understand their strengths and weaknesses. For me, my games were interrupted to many times to interpret the rules which caused too much frustration for the game to be enjoyable for me. Maybe with more time and a base understanding of the “conflict” rules, I could enjoy the game more. As of now I am giving the game 3 out of 5 stars. Add a Review for "Android: Netrunner"